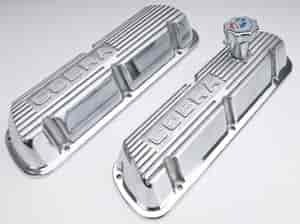 Ford Racing Valve Covers are designed to dress up your engine compartment and still maintain the quality fit and function you are used to with your factory valve covers without all the leaks or excessive crankcase pressure build up common with other aftermarket valve covers. Ford Racing has baffled and non-baffled valve covers that are available in many finishes with different logos. Ford has designed specific units to work with engines using the factory fuel injected intake manifolds or factory style fuel injected intake manifold. Most valve covers are 50-state street legal when installed with the proper closed PCV hardware (included). Tall valve covers are designed to clear roller rocker arms with poly locks. Sold in pairs except #397-M-6582-16K. Does Ford Performance M-6000-D302 fit your vehicle?